Surprises, for the most part, are a good thing. I’ve never owned a Thermaltake chassis before, so I didn’t know what to expect from the Core V51. So, one way or the other, I was sure to be surprised with it. And, it did surprise me in many ways. Read on to see whether or not the surprises were the good kind, or the not-so-good. But good, happy surprises? Bring ’em on! I honestly didn’t know what to think of Thermaltake’s Core V51 chassis before I got it in for review a few weeks ago. I mean, it’s been forever since the last time I actively wanted to look at one of the company’s chassis; we at Techgage have gone a full three years plus since comrade Ryan Perry last reviewed one as well. And I’ve never owned one. It’s not that Thermaltake chassis are bad. From the ones I’ve had a chance to look at in brick-and-mortar stores around me, I can say they’re solidly built, if a bit quirky aesthetically speaking. Not only that, but, except for a precious few examples, most of the company’s offerings just seemed to be too ordinary in terms of features and/or design. The long and short of it is I just never have found a chassis from the company that I was attracted to. However, the Core V51 is a bit of a game changer, at least for me. It’s definitely the first Thermaltake chassis that has really called out to me, and it has sort of kindled that spark of interest in a few more of the company’s chassis offerings. The Core V51’s aesthetics strike a perfect balance between clean design, functionality, and a visual style that is aggressive and suggestive of performance without being brutal about it. The front fascia is perforated, ensuring the easy intake of air into the chassis. Its left side panel features a flush-mounted clear window, perfect for showing off your PC’s naughty bits. And, like a sports car’s big wheels, two chunky skids going across the chassis’ width give off a muscular, powerful vibe while simultaneously giving both superb stability and ample ground clearance for optimum air intake through the chassis’ bottom. Here is a close-up of the front I/O cluster. Handsome and simple, it features a centrally-located power button, with the 3.5mm audio ports and small reset button to its left and a pair of USB 3.0 ports to its right. The power button’s circumference glows blue when the system is switched on. Indicative of Thermaltake’s attention to detail is the distance between the two USB ports. The gap is wide enough to accommodate a pair of wide USB devices without much fuss. Next we look at a combined view of the Core V51’s windowed left side panel and the rear of the chassis. Normally I’d take a photo of the side panel head on, but because of the window – and the fact I have to shoot with a speedlight – I simply couldn’t get a good-enough shot without the glare of the flash. The window, as mentioned before, is flush-mounted to the side panel. The rear panel, meanwhile, is notable for having eight PCI expansion slots and three openings with rubber grommets for externally-mounted radiator tubing to pass through. This photo also shows that the Core V51 has the power supply mount on the bottom of the chassis. Speaking of the chassis’ bottom, here is a photo of it. Prominent are the wide front and rear skids, as well as the two removable air filters. Note: To remove the front air filter, it is necessary to take the front fascia off first. The rear filter simply slides on and off of its rails, as seen on the right of the photo. Here’s a look at the right side panel. It has a muscular bulge in its mid-section. Other than that detail, though, it’s pretty standard fare. Moving on to the top of the Core V51, we can have a look at the flexible mesh cover on the chassis roof. It’s quite reminiscent of another chassis I reviewed a few months ago. The mesh cover attaches to the chassis roof via a magnetic ring on its perimeter. The roof section is designed quite intelligently: It gives users options as to where they can mount up to three 120mm/140mm fans or radiators as big as 360mm/420mm. More specifically, the design of the roof section allows how deep into the interior the fans/radiators can be mounted. This is the first chassis I know about that has this feature. Speaking of fans, the Core V51 can accommodate up to three 120mm/two 140mm/one 200mm fans at the front, up to three 120mm/three 140mm fans/two 200mm fans on the roof, one 120mm/140mm fan at the rear exhaust position, and as many as two 120mm fans on the floor. Out of the box, it comes with a pair of 120mm fans up front and a single 120mm fan at the rear. Here’s a look at the bare interior of the Core V51. It is all-black, including all of the cable sleeves. Following an increasingly popular PC chassis design trend, nine motherboard standoffs come pre-installed. Also notable are the drive cages: All of them, including the one for the pair of 5.25″ optical drives, can be removed if so desired. The drive cages are secured to the chassis via thumbscrews, so it’s very easy to remove and re-install them back onto the chassis. While the optical drive retention mechanism is a conventional tool-less design, the storage drive cages have sleds onto which individual storage drives can be installed. 3.5″ HDDs can be installed without screws, but 2.5″ drives must be screwed into the sleds for best results. The above photo shows a couple of the sleds withdrawn from their installed positions in the drive cages. Thermaltake designed a very clever way to mount a storage drive on the backside of the drive cage area. Basically, you install your drive onto a sled, then mount the sled on catches designed to hold the sled in place. It’s a very simple execution of another PC chassis feature that’s becoming more popular these days, and one I’ve raved about a couple of times already. The Core V51 also comes with a bag of accessories and a quick start pamphlet. The accessories bag includes all the screws you’ll need to install a system into the chassis as well as zip-ties and a metal bracket for mounting a radiator in the front intake position. Unfortunately, I forgot to photograph the accessories package before I installed the test system into the chassis. Now that we’ve completed our visual tour of the Core V51, let’s install our test system into it and see how well it works. I’ll be reviewing the Thermaltake Core V51 on a few key criteria: ease of system installation; cooling performance; a subjective evaluation of its noise output characteristics; and a few miscellaneous subjective observations and comments about the chassis and its design and features. Here is a look at the test system installed in the Core V51. System installation is easy and straightforward for the most part. The aforementioned pre-installed motherboard standoffs go a long way towards easing installing the motherboard. Installing items like the GPU and a radiator is also easy as can be, with no struggles worth the name to speak of. I did install a PSU that’s longer than the norm – it’s none other than Thermaltake’s prodigiously powerful Toughpower 1500W Gold – and this did highlight a slight difficulty as far as routing the power cables through the cable management hole closest to the PSU. The Toughpower 1500W Gold’s length cuts the size of that opening in half. It’s still possible to shoehorn that bulk of cables through, but just be mindful of this mild inconvenience (if you want to call it that) if you use a similarly-sized PSU in your build. The storage drive retention system is a joy to use. Thumbscrews are a convenient solution for securing the drive cages themselves, and the sleds are easy to use as well. Even though the sleds are plastic, they don’t feel cheap or fragile, and the way they move in and out of their cages suggests high-quality engineering. Moving on to thermal testing, I will use the OCCT CPU stability test program to generate maximum CPU load and temperatures as well as MSI Kombustor for the GPU temperature testing. Ambient temperature will be kept constant at 72°F/22.22°C. A preliminary note about thermal testing: A PC chassis being reviewed ought to be in as close to stock configuration as possible. That means I won’t add fans to the system (other than what comes with certain components’ cooling systems). Also, per my now routine practice, I’ll also use the same exact torture tests to put the CPU and the GPU under maximum load conditions. OCCT is the torture test of choice for the CPU, while MSI Kombustor fits the bill for the GPU. According to the accumulated data, the Core V51 fares worst among the closed chassis. The difference between it and the second worst performance is a scant 1° C, which is a negligible difference. But while things look relatively regular and predictable in the CPU temperature tests, the result in the GPU temperature test really grabs your attention. Unfortunately, it’s the bad kind of attention. Talk about really bad surprises. I was a bit shocked at the 74° C maximum temperature that our test system’s GPU registered. I actually had to check to see if perhaps I had left a power cable to either the radiator fan or the GPU cooler’s water pump unplugged. Both power connectors were plugged in, and I redid the temperature testing three times more. The performance never improved, however. And I’m honestly at a loss as to why the Core V51 performed six degrees Centigrade worse than any previous close chassis in our ever-growing list of TG test subjects. Moving on to noise output, there’s not much to say about the Core V51. On a purely subjective level, it’s as quiet as any closed PC chassis I’ve tested, and the supplied fans emit no discernible noise output. In terms of build quality, it’s hard to say anything truly negative about the Core V51. The body structure feels as solid as a tank, and the fit of the panels is likewise good. The plastic bits don’t feel cheap, and while the metal (SPCC steel) may lack the luxuriant feel of aluminum, it also doesn’t feel nearly as fragile. I just wish I was a bit more careful with the transparent window on my review sample. A careless moment gave it a scratch on the inside surface. Totally mea culpa, of course. But do be advised that this is always possible with side panels with a window panel. Let’s move on now to some final thoughts. I said at the outset that I love surprises, especially good ones. 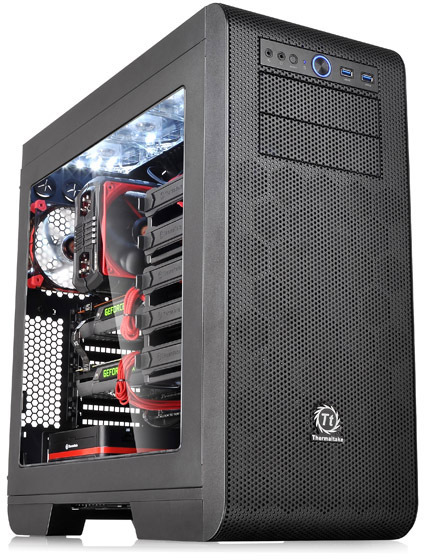 For the most part, the Thermaltake Core V51 delivers a plethora of good surprises throughout. Of course, long-time Thermaltake buyers may not be so surprised at how good the Core V51 is. But as a first-time user of the company’s chassis, I found much to be pleased with. Where other Thermaltake chassis designs leave me cold at best or, well, unhappy at worst, the Core V51 is attractive and stylish and aggressive without being over the top. In this regard alone, it was a big and pleasant surprise. I really enjoyed working in it, too. The roof section is innovative in some ways; but even when it has a feature that other companies have already done (the flexible magnetized roof air filter), Thermaltake’s execution of the concept is just as good as its competition. The Core V51’s interior is well designed as well. Flexibility and versatility are strong points, as is the good quality of the materials used. Performance is also a good surprise, for the most part. CPU max temperatures are typical of its competition in the market. Noise output characteristics are also similar to most chassis I’ve tested. Perhaps the only rude surprise, really, is the Core V51’s performance in the GPU max temperature tests. I still don’t know how to explain that one, to be honest. But it’s a bit troubling to see the test machine’s GPU register peak temperatures hotter by six degrees Centigrade than the next-worse test chassis. In summary, though, it’s hard to not be attracted to the Core V51, even despite the frankly shocking GPU max temperature performance. Even despite the relatively “bad” performance in that metric, the truth is that the GPU can survive operating at even higher temperatures than the 74° C registered whilst installed in the Core V51. Thermaltake seems to have priced this chassis at $109.99; most vendors sell it at that price point. This is a pleasant surprise as well. You really do get a lot for this amount of coin. There’s so much to like about the Core V51. I’m honestly surprised at myself for liking it as much as I do. Attractive design – stylish, aggressive, yet still classy. Intelligent engineering – roof section is innovative, if not 100% original in design concept. Inexplicable performance in GPU maximum temperature tests.